There are two kinds of people in the world: those that drive cars and those that for live cars. Chicago Wolves defensemen Chris Casto and Kevin Lough are the very embodiments of these people. On Monday, both attended Family Day at the 2018 Chicago Auto Show. Naturally, one was more hype than the other, but both were happy to be at the event, mingle with fans and, most importantly, check out the latest and greatest vehicles and automotive technology. The 25-year-old Lough drives a Subaru Impreza that gets him from Point A to Point B and he’s okay with that. On the other hand, Minnesota native Casto lives and breathes cars. It’s a passion that runs deep and is entrenched in the family. The 26-year-old fondly recalls his father’s muscle cars and tales from the drag strip that predate the younger Casto’s existence. Thanks to a foundation laid by his dad, Casto has become a student of the automobile. He has taken time to study the mechanics of vehicles and still keeps up with the latest trends and technologies. To follow in the footsteps of his father, Casto would love to be more hands-on and get behind the wheel of a race car (Formula 1, not NASCAR! ), but he has accepted the limitations of his current lifestyle. 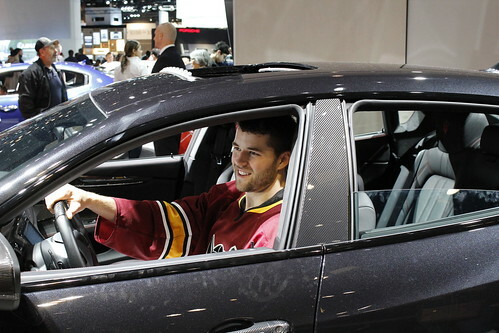 So visiting the Chicago Auto Show was a welcomed opportunity.